In an era when many French composers produced Italianate sonatas, Leclair wrote with the particular authority he gained from having studied in Italy: his music is idiomatic but ‘dangerous’, melodious but also surprisingly quirky. A natural showman, who performed violin sonatas and concertos in the first public concerts held in Paris, he clearly enjoyed surprising and amazing his audiences. His music isn’t easy to bring off in performance because the original sense of its novelty has faded, leaving players today with the challenge of illuminating and balancing the subtle clues that remain and, possibly, because of the complex character of the man himself. The violinist, Adrian Butterfield, well known for his stylish performances of Handel, has a genuine affinity for Leclair’s music. 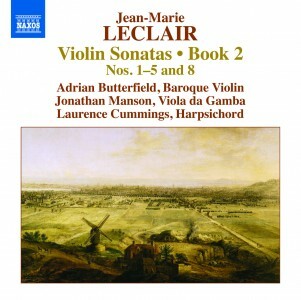 Having completed a three-disc set of Leclair’s Op.1 Sonatas in 2009, he turns here to Op.2 (1728), with a recording of the first five sonatas and a trio (No.8) in which the viol, beautifully played here by Jonathan Manson, is an equal partner with the violin. Some of the sonatas, Nos. 1, 3 and 5 in particular, are equally suited to the flute, in contrast to Nos. 2 and 4, which are distinctly violinistic, incorporating staccato bowings and extensive double-stopping, not to mention fiendish bariolage and double trills. Technically and musically, Butterfield is a marvel. He may, however, be too nice – something that couldn’t be said of Leclair. The Strad says “This trio offers intelligent, idiomatic performances of sonatas from Leclair’s second book, which demonstrates a striking synthesis of Italian melodiousness and French elegance. Adrian Butterfield is a neat and sensitive violinist with a secure technique and a pure tone. His lyricism in the Adagio of no.3 has a winning charm, and he executes the double/multiple-stopping and cross-string bowings in the finales of nos.2 and 4 with substantial accuracy and skill. He employs vibrato selectively, supplies extempore ornamentation in tasteful doses, notably in the Corellian opening Adagio of no.4, and characterises the graceful Aria of no.4 with a lazy French rhythmic inequality. Jonathan Manson and Laurence Cummings provide stylish support. For me, though, Butterfield’s readings would benefit from a more extrovert and less calculated approach.